A prisoner is still on the run nearly a month after he escaped. George Robert Skelton, 29, from North Shields, escaped from Haverigg Prison on 27 August, after he is thought to have climbed a fence. He was serving a six-year sentence for drug offences at the Category C prison, in south-west Cumbria. He drove to motorway services at Southwaite, near Penrith, where a police officer was assaulted in what is believed to be a related incident. 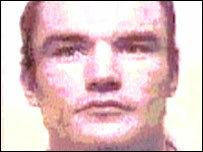 Skelton is described as 5ft 9ins, 11 stone, with brown hair and blue eyes, an oval face and fair complexion.